TSNPDCL JLM Junior Lineman Posts Recruitment 2018 / TSNPDCL # Northern Power Distribution Company of Telangana Limited will give the 2553 JLM Junior Lineman 2018 Recruitment Notification in the month of Febraury 2018 and Northern Power Distribution Company of Telangana Limited (TSNPDCL) will invite the #online applications from the eligible and qualified candidates for the post of JLM Junior Lineman. TSNPDCL JLM Junior Lineman 2018, Online Application Form, Eligibility Criteria, Registration Fee, How to Apply, Last date, Exam Pattern, Exam Date, Hall Tickets, Results and Selection procedure given here. 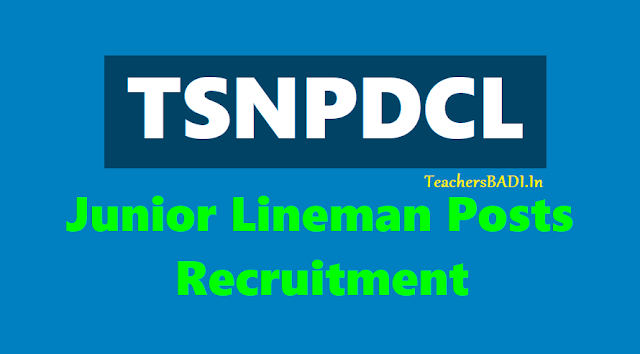 TSNPDCL Recruitment for 2553 Junior lineman Vacancy: - Northern Power Distribution Company of Telangana Limited (TSNPDCL) has issued a latest notification for the recruitment of 1100 posts. The post name is Junior lineman. If you want to make career at TSNPDCL Vacancy then you can apply online application from 21 February 2018 to 19 March 2018. It is golden opportunity for interested candidates, who are seeking government job in TSNPDCL Vacancy. Further other details are given below. TSNPDCL Recruitment for 2553 Junior lineman Vacancy : - Northern Power Distribution Company of Telangana Limited (TSNPDCL) has issued a latest notification for the recruitment of 2553 posts. The post name is Junior lineman. If you want to make career at TSNPDCL Vacancy then you can apply online application from 22 February 2018 to 19 March 2018. It is golden opportunity for interested candidates, who are seeking government job in TSNPDCL Vacancy. Further other details are given below. Scale of Pay: 15585-25200 (15585 – 305 – 16500 – 445 –18725 – 580 – 21625 – 715 –25200). How to Apply: Applications are invited On-line from qualified candidates through the proforma Application made available on TSNPDCL Website. TSNPDCL JLM Exam 2018 Hall Tickets would be released by the Northern Power Distribution Company of Telangana Limited (TSNPDCL) on its official website – TSNPDCL.cgg.gov.in. The Telangana Transmission Corporation aims to recruit 2553 candidates for the post of Junior Lineman (JLM) and is scheduled to conduct the Written Examination for the same in April month. Candidates who had applied for the JLM recruitment can follow the instructions below and download their Hall Ticket at the earliest. TSNPDCL JLM Exam 2018 : Northern Power Distribution Company of Telangana Limited will organize the Written examination from 2 PM to 4 PM on the exam day, at various exam centres in the GHMC area. As per the official website, "THE QUESTION PAPER FOR WRITTEN EXAMINATION WILL BE IN ENGLISH & TELUGU". Candidates who will clear the Written Exam will qualify to appear for the Pole/Tower Climbing Test, details for which will be released by TSNPDCL later.